Margaret Downey, founder and president of the Freethought Society (a nontheist group), shown here at Haverford College, where she volunteered to inform students on how to register to vote. 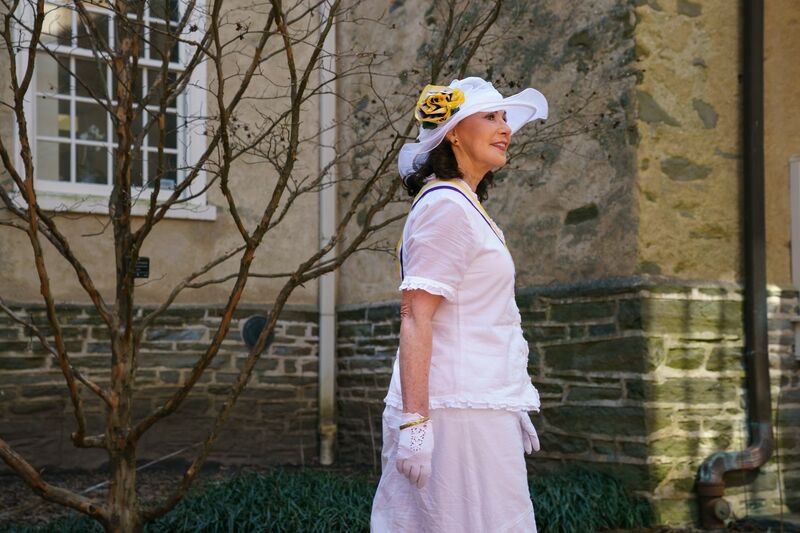 Meet Margaret Downey, founder of the Freethought Society, a group for nontheists headquartered in West Chester. “Have a blessed day!" he said as he walked away. Margaret Downey, founder and president of the Freethought Society, is pictured at right as suffragist Alice Paul. At left, Marjorie Goldman portrays suffragist Susan B. Anthony. While in costume, the women registered students at Haverford College to vote. Those letters remind her of the religious people who harassed her mother, who was Puerto Rican, and her half-sister, whose skin was much darker than her own, over their ethnicity and language while she was growing up in Baton Rouge, La., in the 1950s. “My mother was terrorized by all these people who claimed to be Christian one day and were hateful the next and I’d ask so many times ‘Why? Why?’ ” she said. “I began to think about ‘What is morality? What is good treatment of people?’ "
“One day we were in the car and I said: ‘I looked up everything I could and I read those things in the Bible my mom said I should and I don’t believe any of it. It’s such nonsense,’ " she recalled. “He said, ‘Oh, Margaret, that’s because you’re an atheist.’ "
Sunny Chai, left; Urgyen Wangmo, second from left; and Margaret Downey, right, founder and president of the Freethought Society, discuss registering to vote at Haverford College. Margaret Downey in the nurse costume she wears to conduct her Friggatriskaidekaphobia Treatment Center, a campy anti-superstition project. “If we look at the things we all appreciate about life, like the love and friendship of family and friends, we can find common ground,” she said. “Those are the things that pull us together." The underground video game tournaments run by James “Jimmy Thousands” Nix draw players from ages 12 to 46. Hazel Edwards left her all-boys school after coming out as trans. Now, she leads LGBTQ trainings there.